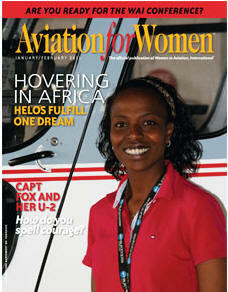 January 14, 2011 - Women in Aviation, International has announced the new members of its Pioneer Hall of Fame. These women will be inducted into the Pioneer Hall of Fame during WAI's 22nd Annual International Conference which will be held on February 24-26, 2011, at the Grand Sierra Resort in Reno, Nevada. The ceremony will take place at the closing banquet on Saturday, February 26, 2011. Dr. Peggy Chabrian is President and Founder of Women in Aviation, International. She has grown the organization from its first conference attended by 150 people in 1990 to an organization representing thousands of women in all aspects of aviation today. She is a multi-thousand hour commercial pilot as well as a rotary-rated pilot and flight instructor who has been flying for more than 20 years. Prior to her founding Women in Aviation, International, she held several top positions in aviation education including Academic Dean and Associate Vice President of Parks College; Dean of Academic Support for Embry-Riddle Aeronautical University's Prescott, Arizona campus; Director of the Center of Excellence for Aviation/Space Education at ERAU's Daytona Beach campus; and Department Chair of the aviation department at Georgia State University in Atlanta, Georgia. L. Tammy Duckworth serves as the Department of Veterans Affairs Assistant Secretary for Public and Intergovernmental Affairs. As Assistant Secretary, Duckworth advises the Secretary of Veterans Affairs on matters relating to media and public affairs. Duckworth served as the Director of Illinois Department of Veterans' Affairs from 2006-2008. A Major in the Illinois Army National Guard, Duckworth served in Iraq as an Assistant Operations Officer and also flew combat missions as a Black Hawk helicopter pilot. During a mission north of Baghdad in 2004, a rocket-propelled grenade struck the helicopter she was co-piloting. As a result of the attack, Duckworth lost both of her legs and partial use of one arm. She received many decorations for her actions, including the Purple Heart, the Air Medal, and the Combat Action Badge. In 2008 and 2009, she completed the Chicago Marathon, fulfilling a promise made at Walter Reed. She has also resumed flying as a civilian pilot. Maj. Gen. Susan J. Helms is Director of Plans and Policy, U.S. Strategic Command, Offutt Air Force Base, Neb. She is directly responsible to the USSTRATCOM Commander for the development and implementation of national security policy and guidance and responsible for the development of the nation's strategic war plan, strategic support plans for combatant commanders and contingency planning for the global strike mission. She has served as an F-15 and F-16 weapons separation engineer and a flight test engineer. Selected by NASA in January 1990, General Helms became an astronaut in July 1991. On Jan. 13, 1993, then an Air Force major and a member of the space shuttle Endeavour crew, she became the first U.S. military woman in space. She flew on STS-54 (1993), STS-64 (1994), STS-78 (1996) and STS-101 (2000), and served aboard the International Space Station as a member of the Expedition-2 crew (2001). A veteran of five space flights, General Helms has logged 211 days in space, including a spacewalk of eight hours and 56 minutes, a world record. Hazel Ying Lee took her first flight in 1932, at the age of 19, becoming one of the first Chinese-American women to earn a pilot's license. Following the Japanese attack on China, Lee journeyed to China and volunteered to serve in the Chinese Air Force. Rejected because she was a woman, she settled in Canton and took a job in commercial aviation. Fleeing before the Japanese advance to China, Lee returned to the United States in 1938. Responding to the call of Jacqueline Cochran, Lee joined the Women Airforce Service Pilots (WASP) in 1943. In 1944, she became part of Class 44-18 Flight B, flying P-63s, P-51s (her favorite) and P-39s. She was killed in a P-63 accident on November 25, 1944. Lee was the first Chinese-American woman to fly for the United States military and the first Chinese-American woman to die in service to her country. Mary Ann Martin Wyall was accepted in the WASP in May 1944 in class 44-W-10 and was part of the last graduating class in December 1944. As a WASP, she flew AT-6s, BF-13s and PT-17s. Post-war, she continued in aviation as a ferry pilot, flight instructor and owner of an aircraft charter business. Wyall has been instrumental in the preservation of WASP history. For 45 years, she personally maintained the WASP history in scrapbooks in her home and sought out the personal stories and memorabilia of other WASP. Wyall served as the unofficial WASP Historian until the WASP documents and artifacts were made part of the Special Collections Department of Texas Woman's University. The Women in Aviation, International Pioneer Hall of Fame was established in 1992 to honor women who have made significant contributions as record setters, pioneers, or innovators. Special consideration is given to individuals or groups who have helped other women be successful in aviation or opened doors of opportunity for other women. Each year, the organization solicits nominations from throughout the aviation industry for the WAI Pioneer Hall of Fame. With the theme "Inspire - Enthuse - Innovate," the WAI Conference will include seminars, workshops, networking events, speakers, and a commercial exhibit area. The Conference concludes on Saturday evening, February 26 with WAI's annual banquet where many scholarships are awarded and the 2011 group of Pioneers is inducted into WAI's Aviation Pioneer Hall of Fame. Secure on line registration is available, and the discounted WAI Conference rate is available at Grand Sierra Resort through January 15, 2011. Discounted registration is available for military personnel and full-time students. Women in Aviation, International is a nonprofit 501(C)(3) organization dedicated to providing networking, mentoring and scholarship opportunities for women and men who are striving for challenging and fulfilling careers in the aviation and aerospace industries.